4 Bdrm Detached Dwellhouse in app 1 acre. Ground flr: V/bule. Hall. Lounge/Dining area on open plan. Dining kitch. Utility rm. 2 Bdrms 1 with ensuite. Bathrm. 1st flr: Cloakrm with wc. 2 Bdrms. Byre/barn (CT band - G). Garden. Garage. Parking. Price over £350,000 Entry by arr. Viewing contact solicitors. (EPC band - E). We are delighted to offer for sale this well presented detached dwellinghouse which occupies an elevated position within a substantial plot extending to an acre approx. 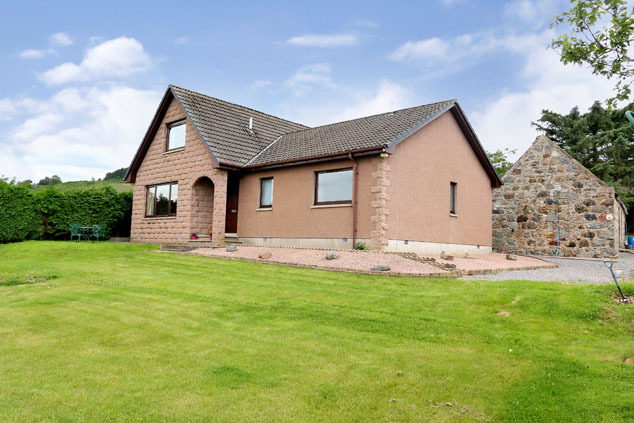 overlooking the Deeside hills and countryside within the quiet village of Strachan. In good decorative order, the property is served by electric storage heating, double glazing and comprises, on entering a vestibule which leads into the hallway which in turn gives access to all rooms on the ground floor including a pleasant lounge with dining area on open plan, spacious dining kitchen with utility room off, master bedroom with en suite shower room, further double bedroom and family bathroom. Upstairs there is a cloakroom and two further double bedrooms. 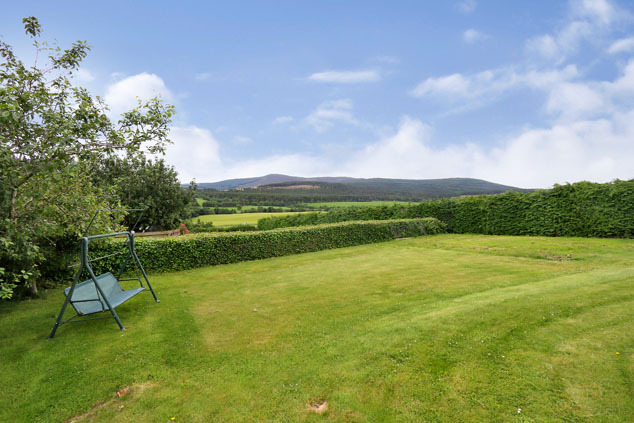 Outside the main garden area is at the front of the property making the most of the superb south facing open views of the Deeside countryside, nicely landscaped it is laid mainly to lawn. At the rear is a parking area, patio and lawn. Outbuildings include a garage, stone built byre/barn, outside store, and log store. Situated in scenic Royal Deeside countryside, conveniently located within the village of Strachan is a village hall and primary school. The larger town of Banchory (approx. 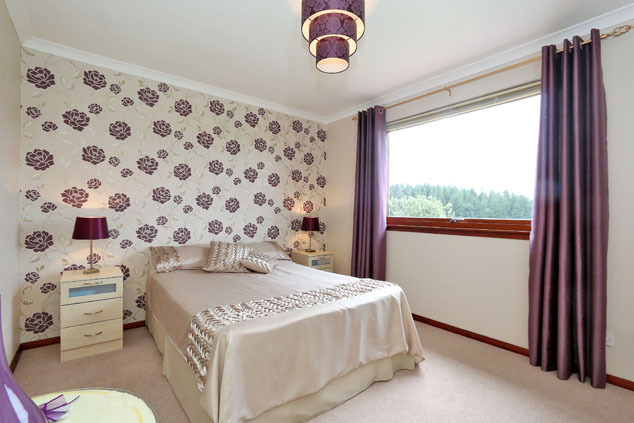 3 miles) is a short drive away with a wide range of local amenities including shops, cafes, medical centre and secondary schooling at Banchory Academy. Entrance Vestibule A hardwood exterior door with matwell gives access to the entrance vestibule which has a built-in shelved cupboard and glazed opaque to the hallway. Hallway The hallway leads to all rooms on the ground floor, has a built-in storage cupboard, access hatch to the loft and stairway to the upper floor. Lounge with Dining Area on Open Plan 24’6” x 15’2” [7.46m x 4.62m] approx. 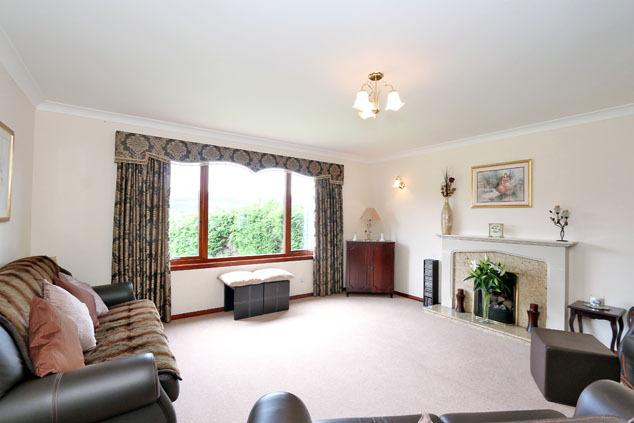 This is a bright and pleasant room with a south facing window which enjoys a lovely open view. An open fire and tiled hearth with sandstone over mantel provides a nice focal point. T.V. and telephone points. The dining area has French sliding doors which open onto the side of the house, internal door to the kitchen and a built-in cupboard. Dining Kitchen 19’5” x 12’2” [5.91m x 3.70m] approx. The spacious kitchen is fitted with a range of oak wall and base units incorporating end display shelving, worktops with contrasting splashbacks and a 1.5 stainless steel sink with mixer tap and drainer. Built-in electric hob, extractor canopy, under oven and integrated fridge. The dining area is nicely decorated with a feature wall with display alcove and has French sliding doors which open onto the rear garden. Telephone point. Utility Room 9’4” x 4’11” [2.84m x 1.49m] approx. Reached from the kitchen, the utility room is tiled to dado height and fitted with a base unit with worktop and stainless steel sink. The freezer will remain and the washing machine will be removed. Laminate flooring. Window and exterior door to the rear. Master Bedroom 12’3” x 10’1” [3.73m x 3.07m] approx. 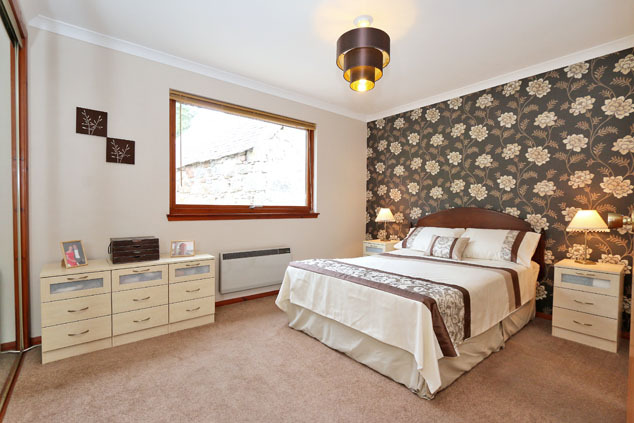 Tastefully decorated with a feature wall, the master bedroom is a well proportioned double bedroom overlooking the rear with a built-in triple wardrobe and sliding mirrored doors. En Suite Shower Room The en suite is fitted with a white w.c., wash hand basin and tiled shower cubicle with mains shower and sliding door. Side facing opaque window and vinyl flooring. Double Bedroom 2 11’10” x 10’0” [3.60m x 3.04m] approx. 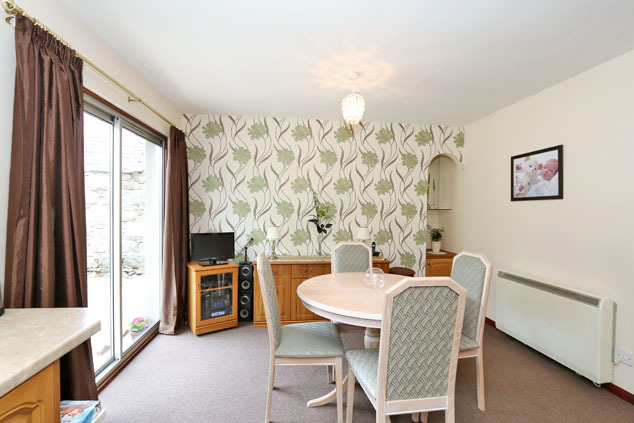 The second double bedroom enjoys a lovely view at the front of the property, is nicely decorated with a feature wall and has a built-in triple wardrobe with sliding mirrored doors. Family Bathroom 9’11” x 7’7” [3.02m x 2.31m] approx. 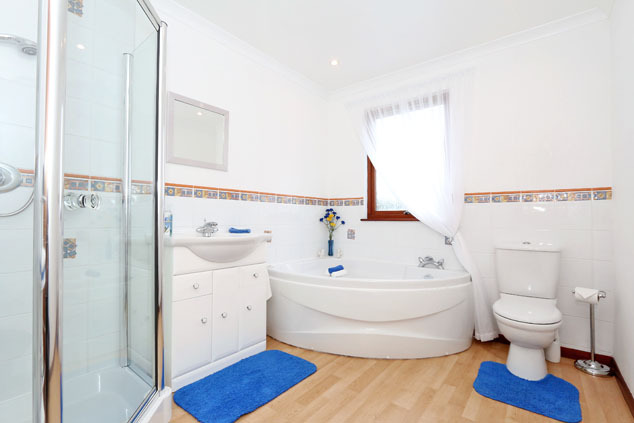 The bathroom is fitted with a white suite comprising w.c., wash hand basin set into a vanity unit, corner bath and tiled corner shower unit with mains shower and glazed door. Front facing opaque window. Laminate flooring and recessed spotlights. Upper Floor Landing The upper floor landing is reached via a carpeted staircase from the hallway, has a built-in shelved cupboard and velux window for natural light. Cloakroom 5’9” x 5’1” [1.75m x 1.54m] approx. The cloakroom is fitted with a coloured w.c. and pedestal wash hand basin and is tiled to dado height. Double Bedroom 3 12’2” x 10’4” [3.70m x 3.14m] approx. 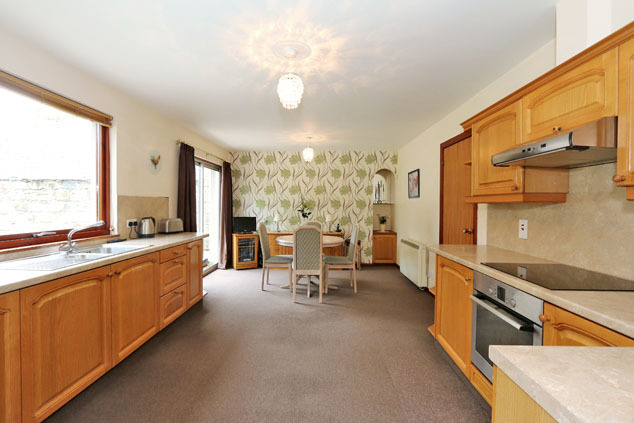 This is a good sized double bedroom with a large rear facing window, two built-in wardrobes and T.V. and telephone points. Double Bedroom 4 10’4” x 8’0” [3.14m x 2.43m] approx. The fourth bedroom is also a double and has a superb elevated south facing view of the open countryside and two built-in wardrobes. Outside The main garden area is at the front of the house making the most of the south facing open views, nicely landscaped it is laid to lawn with a conifer border and areas of stone chips around the perimeter of the house. Beyond the hedge is another area of garden ground which stretches down to the road and pertains the property. The rear garden has a parking area, lawn with rotary dryer and patio. Outbuildings include a garage, stone built byre/barn, outside store and a wood store which is located up at the back of the property. Directions Travelling to Strachan from Banchory, continue to the line of houses on the right hand side as you approach the village. Turn right up the private road adjacent to the wishing well and Collonach Croft is up on the left hand side as indicated by our For Sale sign. Notes Double glazing. Electric storage heating. EPC=E. All floor coverings, most curtains and most light fittings are included. The curtains in the lounge and bedroom two will be removed. The light fittings in bedrooms one and two will be removed. The freezer is included and the washing machine will be removed.